Ready to ship in 2–5 business days. 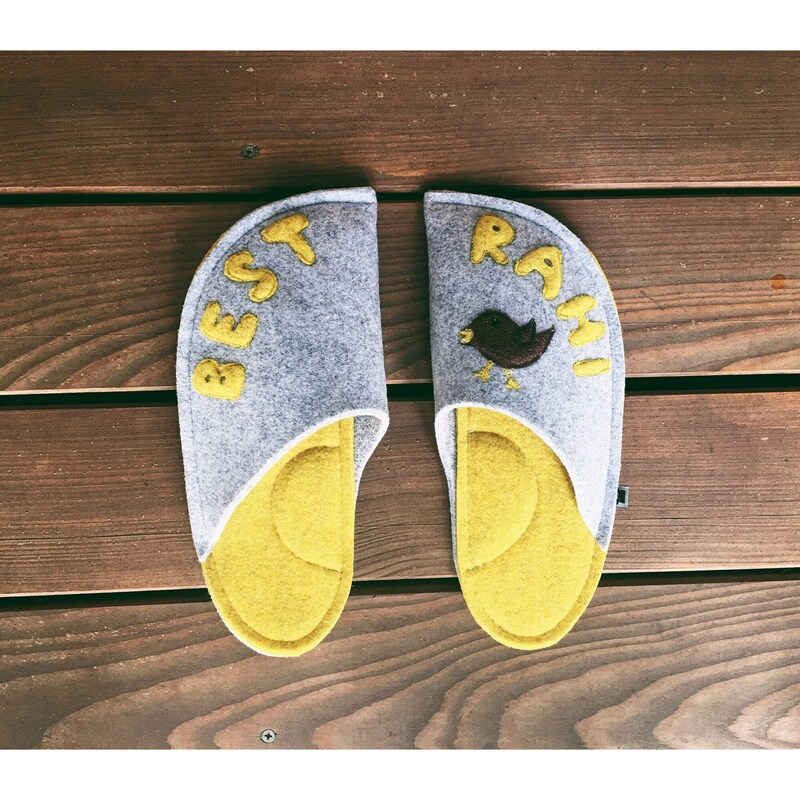 This listing is specially designed for those looking for custom made slippers with customized patches for special events. Just contact us and let us know your idea, send us a photo of the patch you chose or describe a person's hobbies, profession or anything else that is important to you. We will work up a sketch for you to approve. Once approved we will then proceed with production. If for any reason we are not able to reach an acceptable agreement on the design you can receive a refund. Want to add a custom touch? 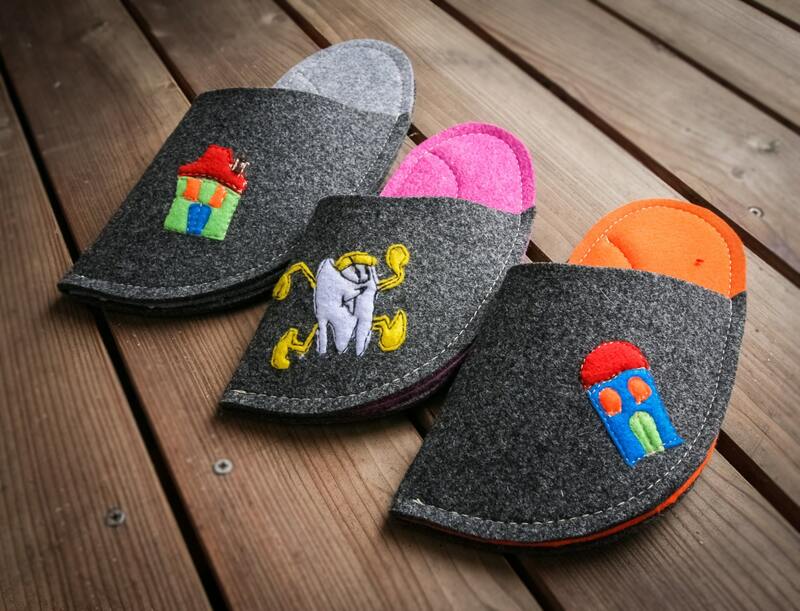 You can choose between different felt colours and different designs of patches. Request a custom order or contact us if you have any other questions. WHAT MAKES OUR SLIPPERS UNIQUE? 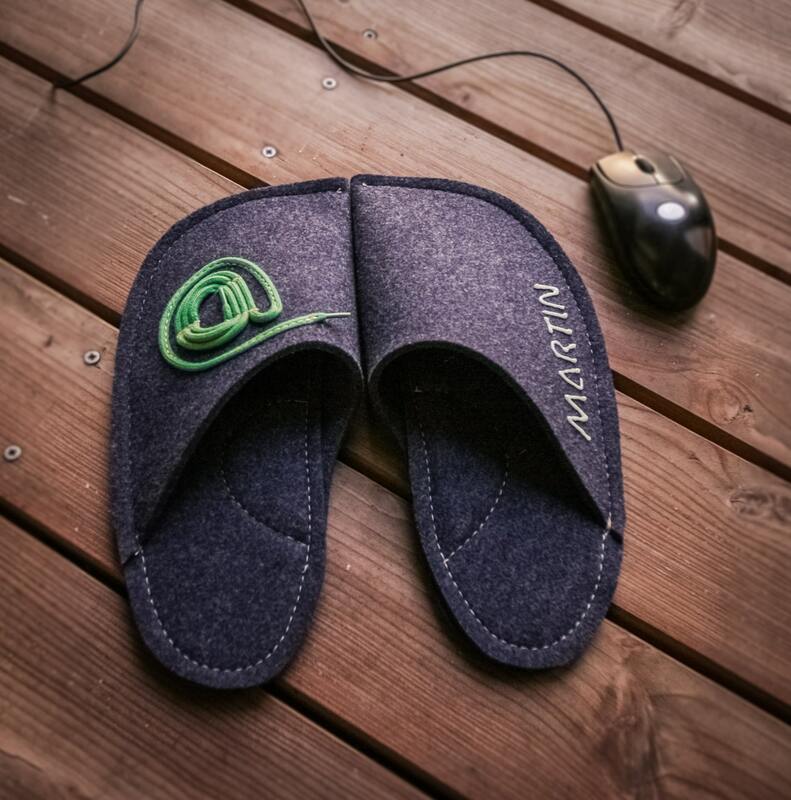 The MadeByBears slippers are designed and handmade in Europe, Slovenia. They consist of wool felt. 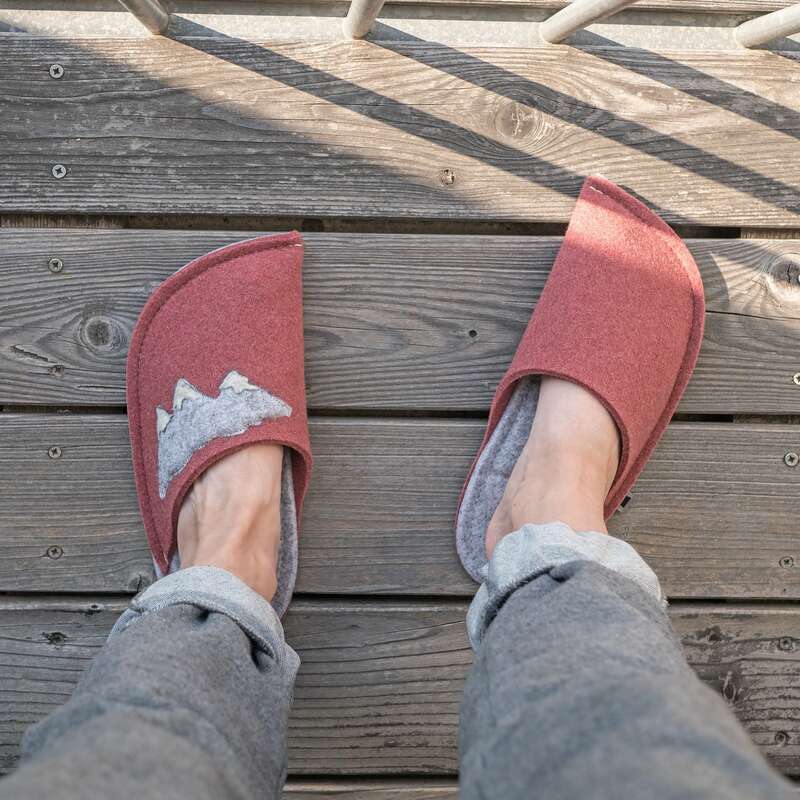 The sole of the slipper is made of two 5 mm thick layers of felt, thus making the slippers extremely soft, comfortable, and durable, making them a good choice for any household. The bottom of the sole is partially covered in latex to prevent the footwear from slipping. Wool felt is a great choice for both winter and summer. During the winter cold it provides great heat isolation, thus allowing your feet to stay warm. During the summer days, however, the wool felt allows your feet to breathe and stay cool, preventing sweating of the feet. 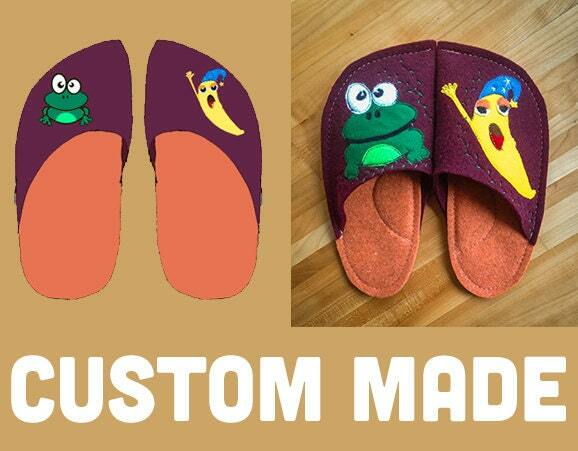 The slippers are available for all ages and sizes, for both men and women, and come in various colors. 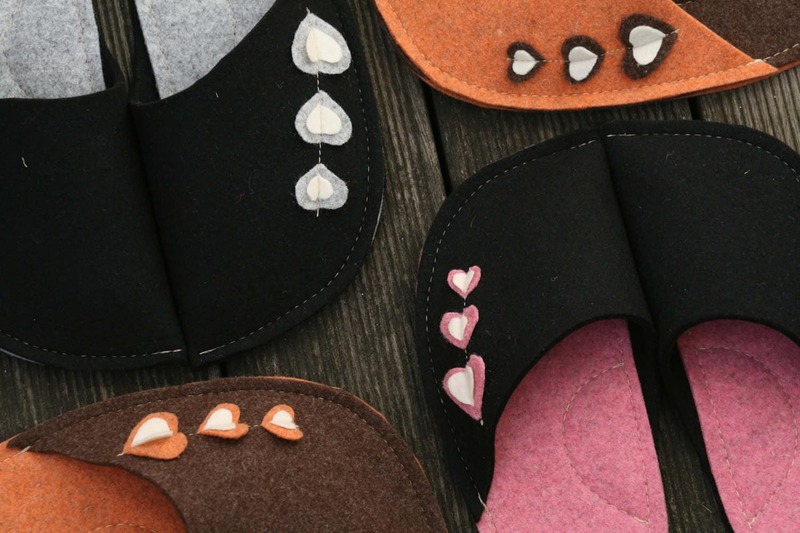 The MadeByBears slippers make for a perfect, neatly shaped gift with a story and a personal touch. The unique design and use of natural and durable materials is our recipe to provide comfort for your feet. Free shipping on orders over $100. When purchasing please click on ''apply shop coupon code'' and type: FREEBEAR. We accept payments via PayPal. Please contact us if you are having problems with making payment. We will be glad to help you. All major credit cards are accepted as well. All prices in the store include VAT. Prices and offers are only valid for the day of the order. We may make changes to products offered in our store or to the applicable prices for such products, at any time, without notice. Upon completion of your purchase you will receive a confirmation email with all the details of your order. We will also inform you when your goods are ready for shipping. All products in our shop are made to order. Processing time for our products is from 2 to 5 business days. After we ship the products you ordered they shall be delivered to your address in Slovenia within 1-3 business days. Shipping to EU countries takes from from 3 to 15 business days. In the case of international delivery (outside EU), the delivery usually takes from 5 to 21 business days, depending on the location. In the event that, due to lack of stock or any other reason delivery dates change or ordered products can no longer be delivered, we'll let you know in time using the contact details provided by you during the ordering process. In the event that you have ordered multiple products and one of them is not in stock, we do not perform a partial delivery of goods (we dispatch the entire order at the same time). We reserve the right to resign from the contract if we can not deliver the desired products. Buyers are responsible for any customs and import taxes that may apply. We are not responsible for delays due to customs. Delivery service reserves the right to verify the identity of consignee of the goods (via personal identification or other document) with the aim of ensuring that the ordered goods can be delivered to the right customer. The product will be send in resistant paper packaging. The package is closed by sewing. We can add a personal note in the package if needed. Please contact us. Processing time for our products is from 2 to 5 business days. You have the right to cancel your purchase within 14 days without stating any reason. The statutory cancellation period is 14 days starting from the day when you or a third party, who is not the carrier, has taken possession of the items or, in the case of part deliveries, the final item. The only cost to the consumer in relation to withdrawal from the contract is the cost of returning the goods. The goods must be returned within 14 days of the filed notice of withdrawal from the contract (purchase). Goods must be returned intact and in the same quantity. We may refuse any repayment until we have received back the goods or until you have provided proof that you have sent back the goods depending on whichever is earlier. by means of an unequivocal declaration (e.g. by a letter sent by post or e-mail) of your decision to cancel your purchase. If you bought your items at our Etsy shop and would like to return them, you can contact us via Etsy. To observe the cancellation period, it is sufficient for you to send the statement of your wish to exercise your cancellation rights before the expiry of the cancellation period. When returning items, we recommend that you use tracked delivery, as we assume no responsibility for lost returns. We will only assume responsibility of the package when it has arrived at our address. You will be informed by email as soon as we have received it. You are responsible for any costs associated with returning the item to us including any currency conversion costs. In the case of worn out or used products we unfortunately will not accept returns, except in the case of latent defects. Our store reserves the right to assess the eligibility of return claims. Costs of return of defective products via Slovenian post are covered by our store. To fulfil your order, you must provide us with certain information (which you authorized Etsy to provide to us), such as your name, email address, postal address, payment information, and the details of the product that you’re ordering. 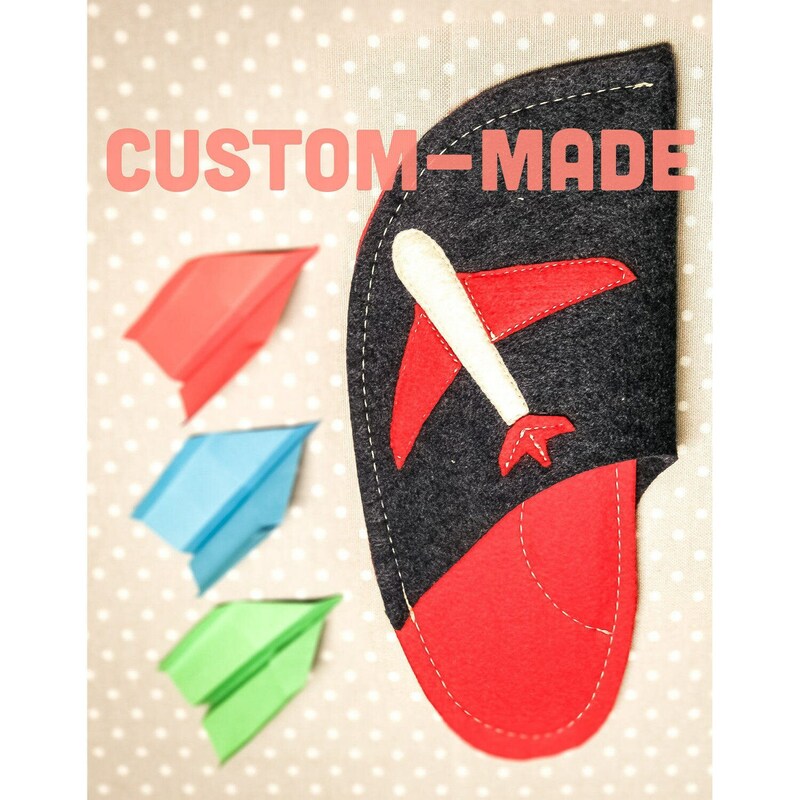 You may also choose to provide us with additional personal information (for a custom order of slippers, for example), if you contact us directly. We may use Facebook Conversion Tracking Pixel. This tool allows us to understand and deliver ads and make them more relevant to you. The collected data remains anonymous to us and we cannot see the personal data of any individual user. Can I order custom made product? Yes, you can. Please, request custom order in our shop and simply message me your idea or describe a person(s) hobbies, profession or anything else that is important to you. We will work up a sketch for you to approve. Once approved we will then proceed with production. If for any reason we are not able to reach an acceptable agreement on the design you would receive a refund. Any beautiful product - especially if it is entirely handmade, deserves to be taken care of. Brushing the products with nicely warm water from time to time will keep them smiling for a long time. Try not to use harsh cleansing shampoos. After that, just let them breathe for some time so they completely dry out.